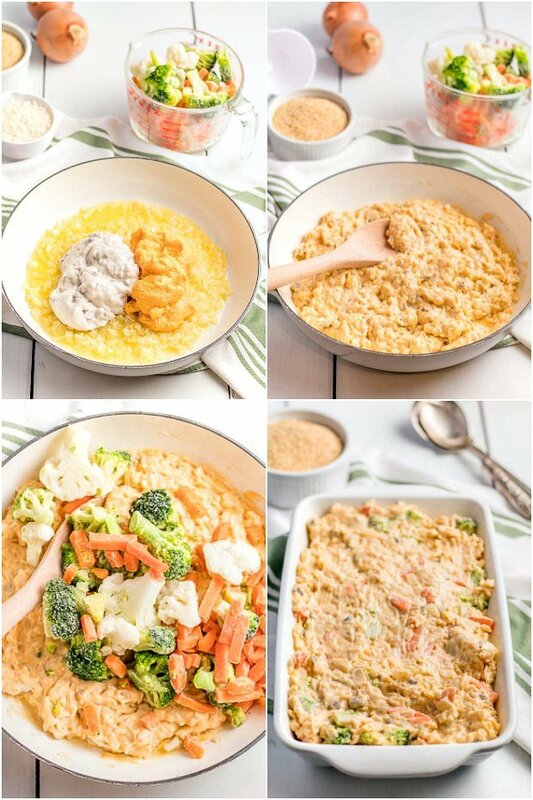 My grandma’s easy vegetable casserole recipe is the best casserole recipes in our family. This is the go-to for our family from my aunts to even second and third cousins. 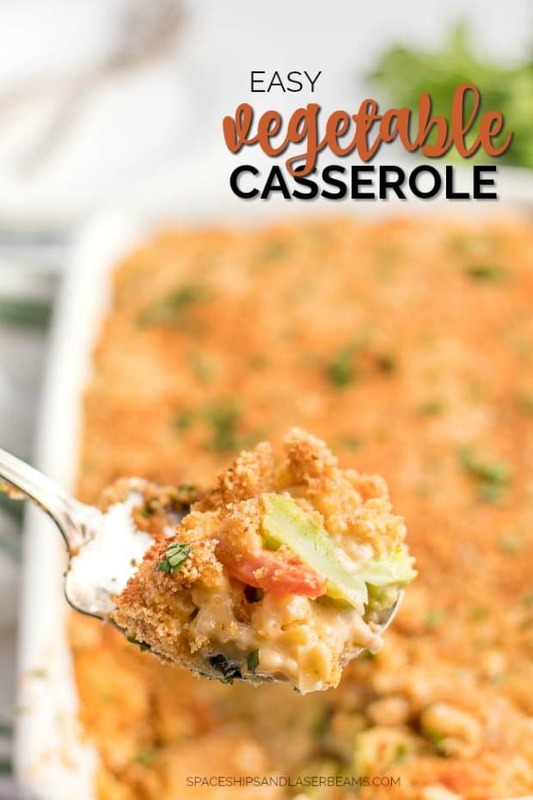 That’s how popular this veggie casserole recipe is in our family! It’s a must have for any family potluck, and it’s always one of the first dishes to disappear. It is also so perfect to make ahead, it’s easy to cook it in the morning and set aside before you head out to work. Just start the baking once you’re home and it’ll be ready by dinner time. Serve it with our easy meatloaf and these fluffy dinner rolls on the side for a weeknight options. Bring it, along with green bean casserole or cowboy casserole, to potlucks! 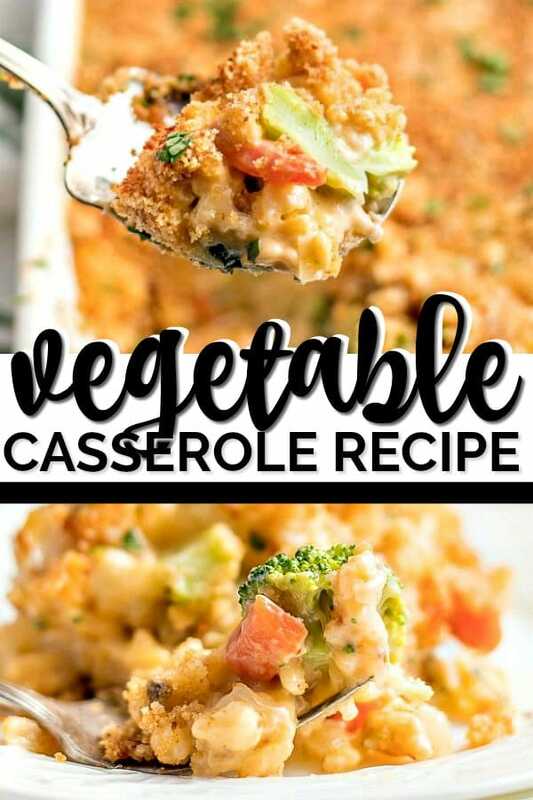 I always like to add a little bit of creativity and make this veggie casserole little different every time. You can replace the California blend vegetables with your favorite vegetable mix, or add chunks of leftover chicken breast. My grandma also likes to gather up the leftover vegetables in her fridge to make a casserole feast at the end of the week. I have various herb breadcrumb mixes I like to rotate through when I’m making this casserole. Rosemary, basil, thyme, and parsley are all great choices. I’ve also tossed in french-fried crispy onions on top. Cheese is also a top choice. Shredded cheddar or Parmesan powder work wonders for adding flavors to the casserole crust. With your scoops of casserole, toppings and garnishes really add an extra flair. I serve mine sometimes with extra french-fried onions, chopped green onions, or just more shredded cheese sprinkled on top. Bacon bits, sesame seeds, and pepper are also really good choices. Herbs like rosemary and thyme will elevate your casserole with an added aroma. Btw, this recipe genius way to trick us kids into eating their vegetables whenever we go to our large family gatherings. 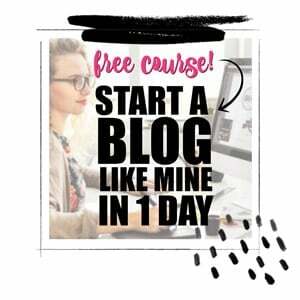 Here are a few tips for preparing before you get started. Preheat the oven to 350 degrees while you’re cooking the dish to prepare for baking. To prevent a massive dishwashing ordeal, spray a casserole dish with cooking spray before you make your dish. To make this mixed vegetable casserole, we first start cooking the vegetables. In a large skillet, saute your onions with 1 stick of Oleo until they’re translucent. Add the mushroom soup, cheese, rice, and the vegetables into the pan. Cook this mix for a little bit and make sure it is nice and thick, and the cheese completely melted. Put this delicious mixture into a casserole dish and cover the dish with a generous sprinkle of breadcrumbs. Dot the other stick of Oleo across the dish evenly. At this point, if you’re baking this later, you can wrap the dish up and put it in the fridge. Once you’re ready for baking, make sure your oven is preheated. Bake the casserole at 350 degrees for 20-50 minutes. 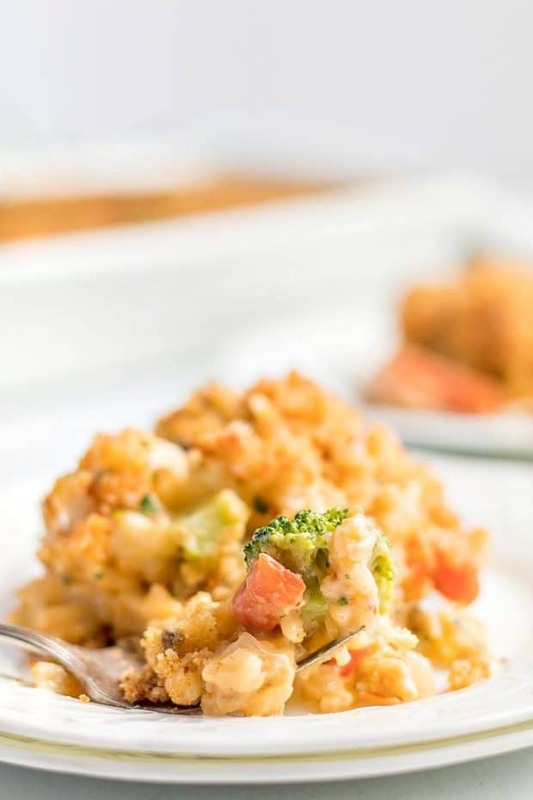 The perfect mixed vegetable casserole should be slightly bubbly and with a lightly golden-brown, crispy crust. Imagine the little crunch when the spoon cuts through that breadcrumb crust…deeeelicious. 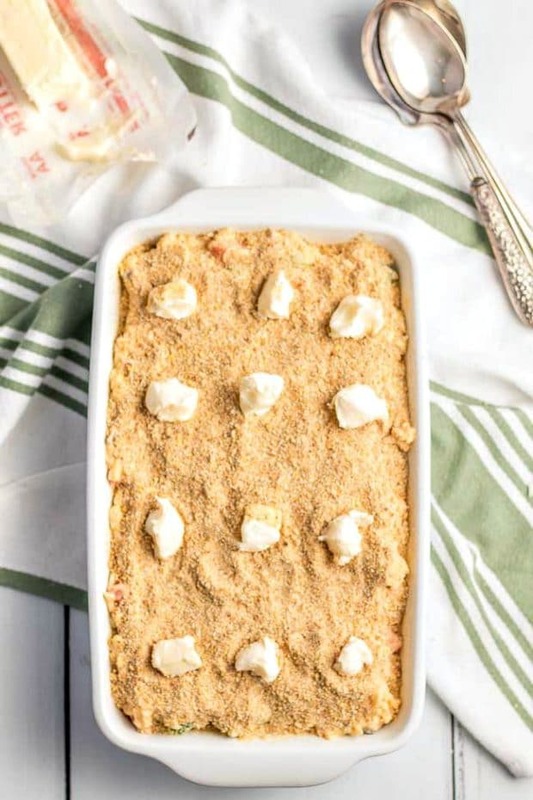 The casserole is delicious on its own, or with a simple caesar salad, but the right partners will also certainly give your vegetable casseroles a pop of flavor. 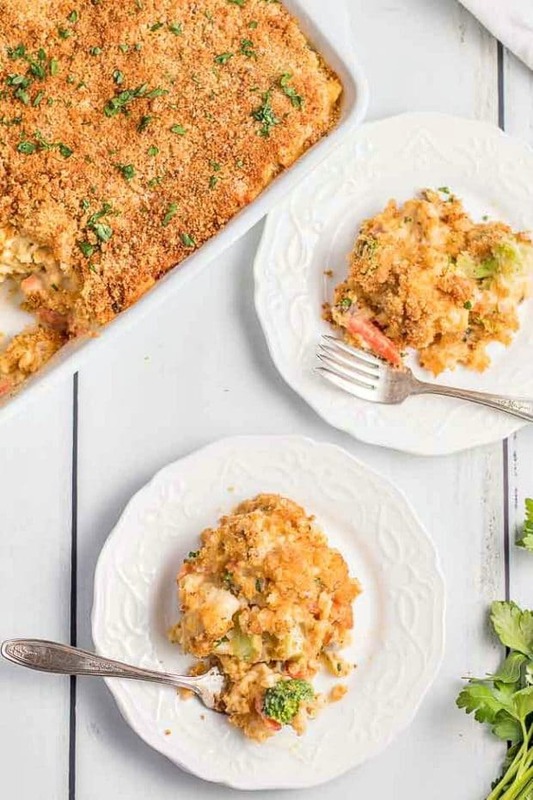 Served alongside a juicy chicken or ham, this vegetable casserole is simply the star side dish. 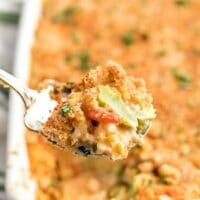 This easy, go-to casserole recipe will become a favorite side dish in your family! Dice the onion and saute in a skillet with 1 stick of Oleo until translucent, then add other ingredients, except bread crumbs, and stir will. Add to a greased baking dish, sprinkle with breadcrumbs and dot evenly with Oleo. Bake at 350 degrees for 20-30 minutes until bubbly and bread crumbs are browned. We absolutely love this delicious recipe – it’s the perfect side dish!